Beans are an important source of protein, especially for low- and middle-income households, but consumption is limited by the high energy and water requirements for cooking beans as well as the long cooking time of 2-3 hours. In recent years, the rapid expansion of urban populations, rising incomes, and the high cost of energy have fueled the demand for fast-cooking processed foods. While canned and frozen beans are available, they are often out of reach for most households due to their high cost and/or the requirement for refrigeration. Developing affordable, convenient, on-the-shelf bean products that require less time, fuel, and water to cook will greatly enhance bean consumption, improve incomes for producers, and conserve the environment. The project pre-screened 47 bean varieties and 12 were selected for production and industrial precooking based on cooking time, color, micronutrient content, and ease of growing. The selected beans have a higher yield potential of up to 2,000 kg/ha, compared to 500 kg/ha for traditional varieties. The project developed three precooked bean products: a ready-to-eat bean snack; a bean flour; and a precooked bean product that takes only 15 minutes to cook. Two production facilities were established, with the pilot factory capable of processing nine tons of precooked bean products per day. The products are now on the market, and surveys indicate that consumer acceptance for precooked beans is 89.1%. Some 14,522 farmers (6,667 men and 7,862 women) were trained on good practices for producing the beans. To ensure enough supply of beans to the factory, 101,393 tons of seed of improved bean varieties were produced and used by over 10,000 farmers (50% women). In order to ensure the sustainability of the project, two seed supply models were tested. The first, the seed credit model (SCM), involved contracting large-scale farmers on credit who then paid their loans back with cash. The second, the revolving seed model (RSM), dealt with small-scale farmers who paid their loans back with seed. In Uganda, farmers accessed 71,810 kg of seed through the SCM in the four seasons of the project’s operation and supplied 880,595 kg for further seed and grain production. Through the RSM, farmers accessed 7,500 kg of bean seed and supplied 102,000 kg of seed. The SCM was selected for scaling up seed production given its potential for production and sustainability. In addition, two models for marketing were tested: a community production and marketing system model, which involved pooling smallholder producer groups for collective production targeting a specific market, and a collective marketing model with seed credit support involving farmer groups. 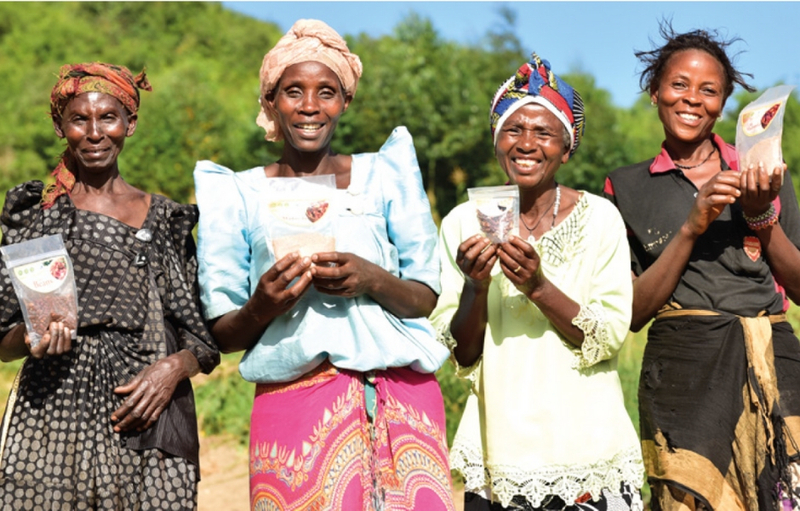 Through the collective marketing model, farmers were able to access 57,558 kg of bean seed. The project has created employment opportunities for men and women farmers producing seed and grain, transporters, those offering casual labour (loading and offloading), and those offering pre-processing services, such as sorting beans. Both men and women participate in bean production, but women play the main roles. Men are mostly involved in the more energy-demanding activities (bush clearing, land preparation), while the majority of women take part in more time-consuming activities that require extra care in handling (planting, harvesting, sorting, winnowing, and management during storage). The introduction of aggregation centers near farmers increased the proportion of women participating in bean marketing. Women’s average incomes from bean sales increased by roughly 28% and the volume of beans sold by women increased by 8%, from 290 kg per capita in 2014 to 314 kg in 2016. Access to credit has been improved for 1,418 women through the facilitation and promotion of village savings and loans cooperatives established for bean farmers. More generally, the precooked bean product reduces women’s time spent fetching water and firewood as well as cooking. Through engaging national standards bodies (Kenya Bureau of Standards and Uganda National Bureau of Standards), reference standards were generated to inform policy and guide the development of other precooked bean products. In addition, a framework for food assessment to address food safety issues at various levels of the value chain was developed. It identified four critical control points and mitigation measures to reduce or eliminate the hazards identified and documented. Cultivate Africa’s Future is jointly funded by IDRC, the Australian Centre for International Agricultural Research, and the Australian International Food Security Research Centre. Learn more about this project and its outcomes.